Arghandab is a river in Afghanistan, about 400 km (250 mi) in length. It rises in the Hazarajat country north-west of Ghazni, flows south-west passing near the city of Kandahar, and then falls into the Helmand 30 km (19 mi) below Girishk. In its lower course it is much used for irrigation, under the control of the Helmand and Arghandab Valley Authority, and the valley is cultivated and populous; yet the water is said to be somewhat brackish. 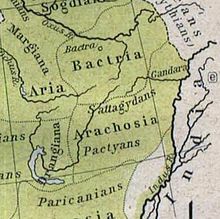 It is doubtful whether the ancient Arachotus is to be identified with the Arghandab or with its chief confluent the Tarnak, which joins it on the left 50 km (31 mi) southwest of Kandahar. The Tarnak, which flows south of Kandahar, is much shorter (length about 320 km or 200 miles) and less copious. By means of her gushing and powerful waves, this (Sarasvatī) has crushed the ridge of the mountains, (breaking river banks) like a man who digs for lotus roots; with praises and prayers, we solicit Sarasvatī for her help, (Sarasvatī) who slays the foreigners. Historian Asko Parpola states: "Arghandab [...] descends from a height of nearly four kilometers down to about 700 meters, when it joins the Helmand River, which eventually forms shallow lakes." Sarasvatī- is interpreted to mean "full of lakes". The ruins at Ulan Robat, supposed to represent the city Arachosia, are in its basin; and the lake known as Ab-i Istada, the most probable representative of Lake Arachotus, is near the head of the Tarnak, though not communicating with it. The Tarnak is dammed for irrigation at intervals, and in the hot season almost dries up. The upper course of the Arghandab river is relatively unexplored. The Historical and Political Gazetteer of Afghanistan cites the explorations of Major G. Lynch in 1841,[b] according to whom the origin of the Arghandab is 20 to 30 miles north of Sang-e-Masha. This places the source in the mountains southwest of the Nawar basin. Lynch also described the upper course of the river as being a "mountain torrent, dashing over great granite rocks and about 3 feet deep where fordable". There is a good deal of cultivation along the river, but few villages. The Kabul-Kandahar Highway passes this way (another reason for supposing the Tarnak to be Arachotus), and the people live off the road to avoid the onerous duties of hospitality. In 2008 a project was initiated to rehabilitate the Dahla Dam and associated irrigation system. Ram Sharan Sharma: "In the Ṛg Veda the Sarasvati is called the best of the rivers (naditama). It seems to have been a great river with perennial water.... The earliest Sarasvati is considered identical with the Helmand in Afghanistan which is called Harakhwati in the Avesta. But the archaeology of the Helmand valley in the second millennium BC needs adequate attention." Rajesh Kocchar: "The Avestan Harahvaiti, phonetically the same as Sarasvati, was known to the Greeks as Etymander and is now called Arghandab. The naditama Sarasvati, however is to be equated not with the Arghandab but with the Helmand, of which the Arghandab is the main tributary. ... There is an uncanny similarity between the Rgvedic description of Sarasvati and Avestan description of the Helmand." ^ Possibly the British political agent Kalat-i-Ghilzai. ^ a b c Adamec, Historical and Political Gazetteer of Afghanistan, Vol. 5 1980, p. 39. ^ a b c One or more of the preceding sentences incorporates text from a publication now in the public domain: Chisholm, Hugh, ed. (1911). "Arghandab" . Encyclopædia Britannica. 2 (11th ed.). Cambridge University Press. p. 475. ^ Parpola, The Roots of Hinduism 2015, Ch. 6, p. 97. ^ Boyce, Mary; Grenet, Frantz (1991). A history of Zoroastrianism. Vol. III, Zoroastrianism under Macedonian and Roman rule. Leiden: Brill. p. 125. ISBN 9004092714. ^ a b Parpola, The Roots of Hinduism 2015, Chapter 6. ^ "Provincial profile for Kandahar Province" (PDF). Regional Rural Economic Regeneration Strategies. Archived from the original (PDF) on 2008-08-28. Retrieved 2008-10-07. ^ Stephen Chase (2008-07-17). "Dahla dam project is potential target: military". The Globe and Mail. Retrieved 2008-10-07. ^ Doug Schmidt (2008-06-11). "Cdn. military to safeguard Afghan dam project". Canwest News Service. Retrieved 2008-10-07. ^ "Signature Project: Dahla Dam and Irrigation System". Government of Canada. Retrieved 2008-10-07. ^ "Dahla Dam -- Summer 2008 (video podcast)". Government of Canada. Archived from the original on 2011-07-06. Retrieved 2008-10-07. ^ "Dahla Dam -- Summer 2008". Government of Canada. Retrieved 2008-10-07. Wikimedia Commons has media related to Arghandab River. 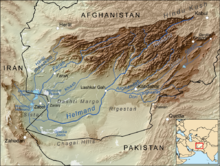 Distance Learning Module 3 - Rivers of the Hindu Kush, Pamir, and Hindu Raj, University of Nebraska, Center for Afghanistan Studies, Retrieved 15 April 2018. This page was last edited on 16 November 2018, at 01:45 (UTC).